OK! So I planted my tomato and jalapeno seeds today. -- I have two heating mats under them, just regular ones set on low. --I have good quality organic potting soil. --I have two florescent lights, however I don't think they will be enough power? and I cant get them close enough to the plants? But at least they are in a corner of room where they will get about 8 hours of sunlight. --I have a 100 mL syringe that I water each pod with. (I keep refilling the syringe of course, it takes about a 600mLs of water to cover the whole tray. So, does anyone have any other suggestions? How do you guys adequately water your trays? And how much is not too little and not too much? The light is critical. Window light is typically not enough. When you say you have two fluorescent lights, you mean tubes? bulbs? How close are they? Light diffuses by the distance squared. So if you move your light from two inches away to six inches away, you have one-ninth as much light. If you are talking about lights on a ceiling, it's pretty worthless. Are the pods in trays? Bottom watering is most effective and least likely to cause problems. Just put a little water in the bottom of the tray, just enough to just touch the bottom of the pots/ pods, so that the soil can wick up the water it needs. Then you can tell how much is enough. By the end of the day it should have soaked up all the water in the tray. Your title said with picture. Instructions for posting pictures here are in New to Helpful Gardener under Helpful Tips and Suggestions for New Members. 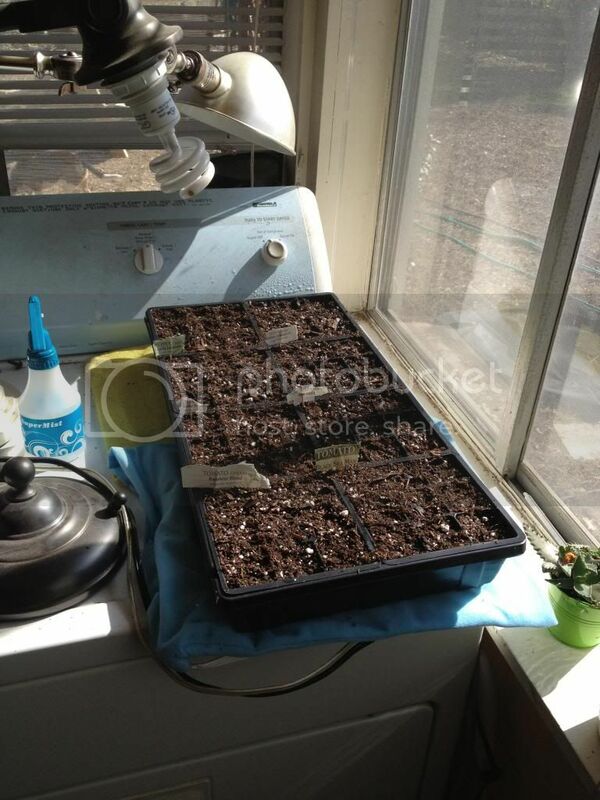 Here is my setup I have a 72 cell seed starting tray. I purchased it for five dollars. It's well worth it they can be reused. For a light I used what I had on hand which was a full spectrum fluorescent floor lamp I turn it on when I wake up and turn it off when I go to sleep so it's getting about 16 hours on, 8 hours off. I positioned it about 5 inches above the top of the tray. You can see a a spray bottle in front of the tray that is filled with calamine tea to prevent damping off. As soon as they all sprout I will take the top off and get some air circulation. Once they are large enough I will move them to the greenhouse outside and then start more. In the meantime I'm going to order a better light but it seems to work pretty good for now these are the pictures above the seeds were planted seven days ago and some have already sprouted. Looks pretty good! More light will be better, but that may be enough for now. Since the seeds are already sprouted, be sure you take the humidity dome off. It is off in the picture of the seedlings, but I wasn't sure if that was just for the picture. Incidentally, very cool how you did the split picture! Rainbowgardener...hahah well you cant see the picture because I completely forgot to attach it! But mine looks like Phonetool's above, except I don't have sprouts yet! But hello?! Great advice! I didnt know you could water from the bottom tray. 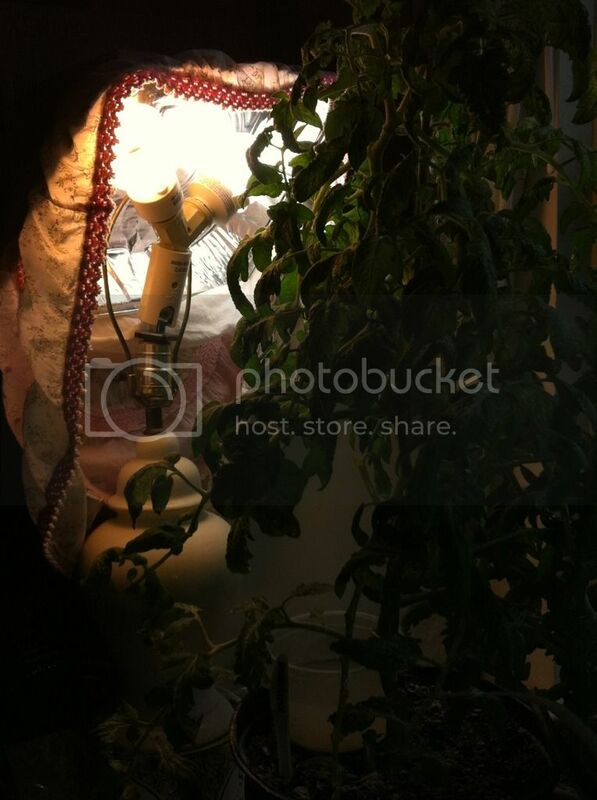 That seems alot more convenient, and to move the lights UP to the light, not trying to get the lights DOWN to the plant. My lights are two flourescent lamps as you can see to the left of the picture. Do you really think that will be enough? Im starting to get skeptical. 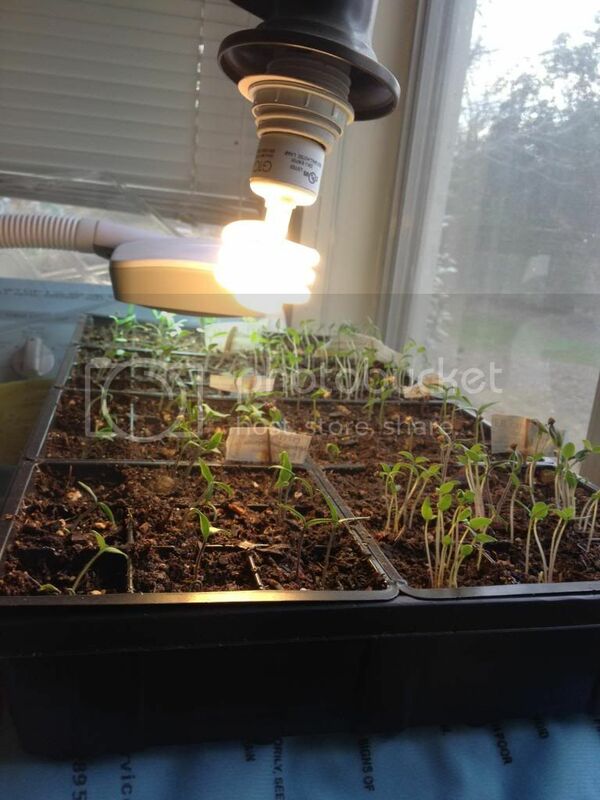 Are there seedling light fixtures out there that are cheap? I think thats what Im concerned with. I saw a set up at our nursery, but it was like $75. augh. I have four foot long shop light fixtures for two tubes and you can get them for about $25 (and then you still have to buy the fluorescent tubes). Get some white perlite and sprinkle and cover the suface below the plants which will reflect the light and help with damping off! I do the same as above. My lights are on chains as the plants get taller up they go on the chains. Just plain 'ole florescent lights nothing special. I keep lights about 1 inch from plants, since florescent's are cool no chance of getting to hot. 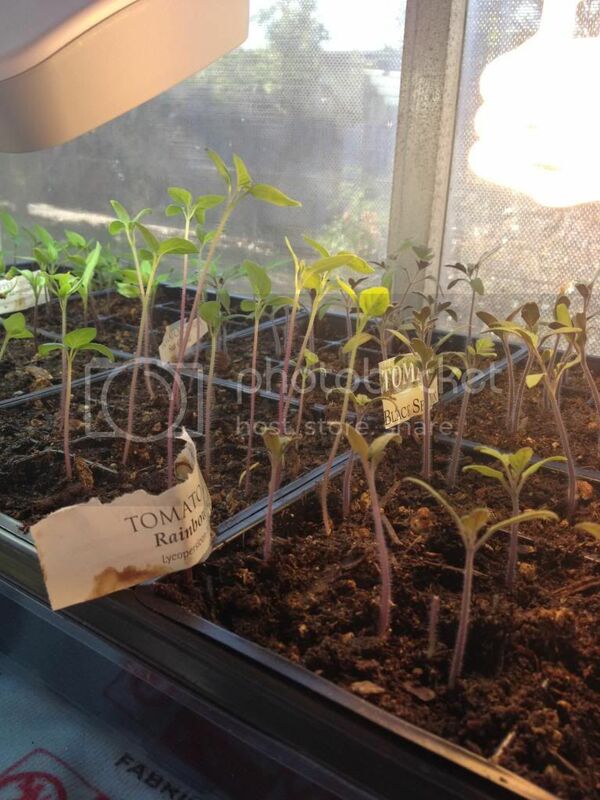 Here is an update of week two of growing tomato and pepper seedlings. I need to thin them right about now, just got to the 2" height mark. I read pepper's roots get stunted if they don't have enough room? Any advice on when I should transplant to bigger pot, if at all? We probably wont be able to plant outside until mid-March here at the earliest. Any way to save the sprouters? 3 weeks down now with my seedlings, and it looks like the Tomatillos are starting to get weedy. I realize this could be from not warm enough temps under the heating mat, or they want more light than their fellow cherry tomato friends? Is there a way to save them from being so tall and falling over? Can I bury the stem more so they will eventually root out from there? It would be nice to save them! This is a good start. They are needing more light -- but you can compensate by planting them deep up to their seed leaves when you Uppot after first true leaves grow out a little bit more. When they are tall like this, plastic drinking cups make good Uppot containers -- make sure to punch about 6 drainage holes in the bottom. Sprinkle a thin layer of soil mix then carefully guide the rootball to the bottom, then fill in one side of the stem, then the other. I used to have an aluminum pie pan here for a single bulb. Also, turn the trays and if you can, shuffle the cells around every so often so everybody gets even light -- not so much leaning. Another idea is to set up a foil/Mylar covered reflector on the side away from the windows. I always use the heavy aluminum foil lid that comes with the lasagna pans, but another favorite source is inside of chip bags. I line walls, shelf and table surfaces, cardboard, etc. with them. Taking the tomatillos off the heating mat might be a good idea too. They will grow more slowly and be stockier if it's colder. About 50-55Ã‚Â°F ambient temp is good for tomato seedlings too. Oscillating fan helps to strengthen the stems as well. 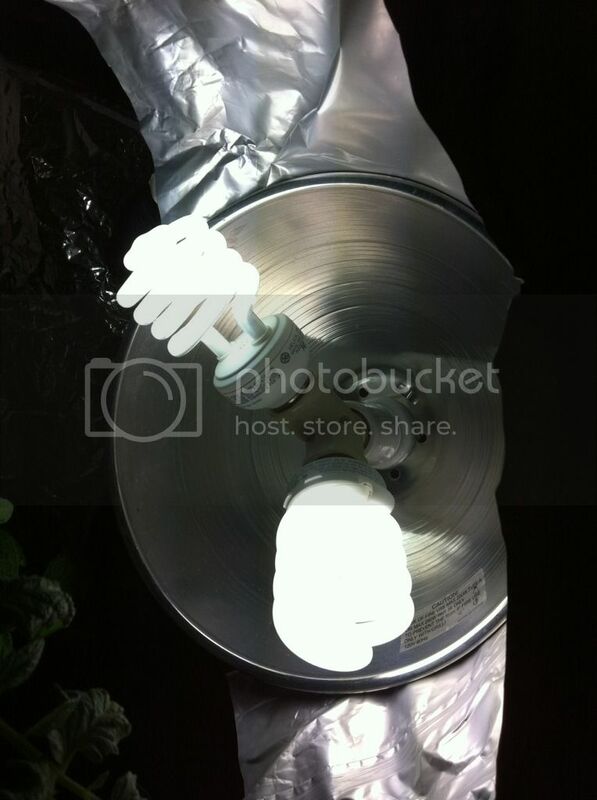 Need more light... have your fluorescents about as close as you can get them to the plants and on 16 hrs a day. Yes, you can bury them deeper. A good time to do that is when you transplant them. Once they have true leaves, you will want to get them out of the little cells and in to something like the cups applestar mentioned or 3 inch pots. I like the idea of a reflector on them to really intensify the light. Going to try that stat! So this week where Im at we are having highs in the mid to upper 70's. I have a black wheelbarrow that I set them up in during the highs of the day to get them more sunlight and wind. I didnt know that the tomatillos acutally wanted LESS heat, I thought they would want more. Good tip I can take them off the heating pad. Thanks for the reply backs. When should I start transplanting these to bigger pots? The roots are already down to the bottom of the pods and each seedlings has about 3-4 true leaves on it. The first pair of plain looking leaves are seed leaves. I like to Uppot them when the second pair which are the FIRST pair of TRUE leaves have grown out and I can see the 2nd pair starting to grow. Be sure to gradually acclimate them to direct sunlight and windy outdoors. The tender indoor grown leaves will sunburn and dehydrate from moisture robbing winds. So what I have been doing is in the mid-late afternoon, putting them outside in full sun for a while so they can 'learn to be outside' and get some good sunlight vs the weaker fluorescent lights. My growing area what they started out in too is kind of half-way greenhouse- half way inside kinda environment. They are in the corner of the washroom with two big windows. Most of these days too we have the house open to get the afternoon breezes. So Im hoping this counts as hardening off as well. They seem to be doing fine. I think I was watering them a little too much actually bc some of the pods got a hint of green in the soil. I skipped a day of watering so they could dry sufficiently before watering again. Plus now I've noticed the roots go all the way to the bottom, so I don't have to put as much water in there for the roots to reach it?